Animals frontman Eric Burdon is the latest famous face fronting Saint Laurent’s Music Project. Not only a musician but also accomplished painter and author, Brit icon Eric Burdon is the latest artist to join Saint Laurent’s Music Project. Frontman of 60s born band The Animals, Burdon has long been a household name, inducted into the Rock and Roll Hall of Fame in 1994. Finding fame with their release of “House of the Rising Sun”, arguably the first ever commercial combination of rock and folk, Eric Burdon and The Animals continued to prosper in the charts throughout three decades. 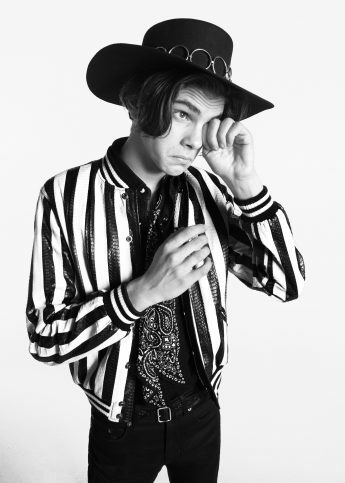 In typical Saint Laurent Fashion, the campaign image was shot by Hedi Slimane in their signature black and white style. After the brand’s focus on children of celebrities last year, it’s encouraging to see a more mature face and a legend recognised by a fashion brand. Understated cool in sunglasses, without even a hint of a smile, Burdon embodies the Saint Laurent attitude as well as any bright young thing.